I was recently given this headset for free from Plantronics. Keep that i n mind when reading the following review. My main complaint with the UC headset market is that all of the focus seems to be on maximizing the resolution and playback of voice audio. Now that is all well and good but it doesn't fit my use case. 90% of my work day is spent listening to music which inherently doesn't use the microphone. What I've always wanted was a headset that sounds just as good with music as it does with voice. 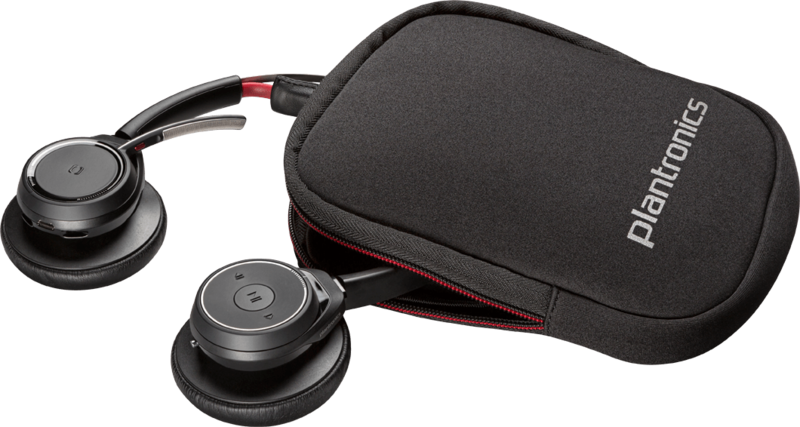 Jabra recently released the Jabra Evolve line of headsets. 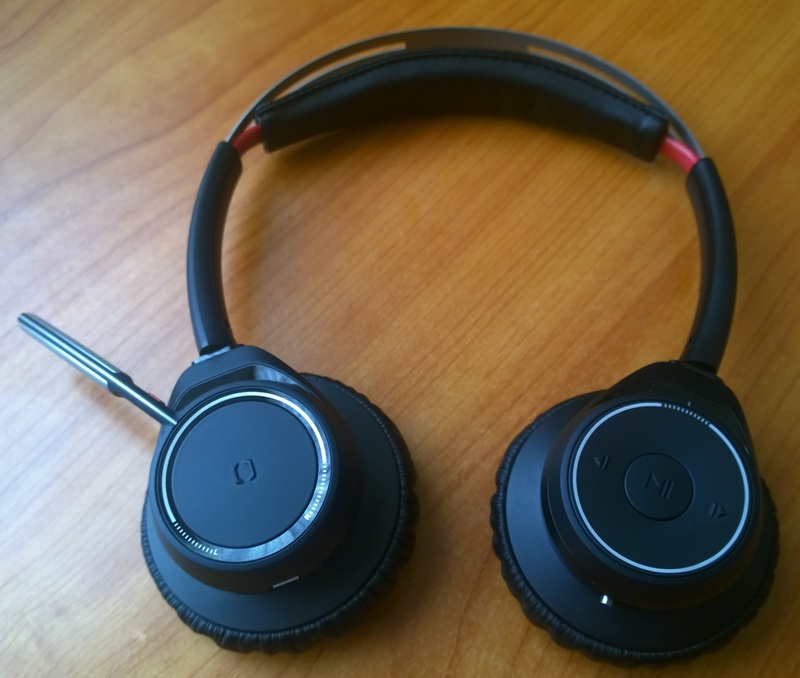 I've only tried the Evolve 80 and that was the first headset that had really good music playback to go along with handling voice well. I have no problems whatsoever with the look or styling of the Evolve 80 I just hate how it smashes my giant egg head and feels really stiff. I could only use it for about an hour before I got a headache. 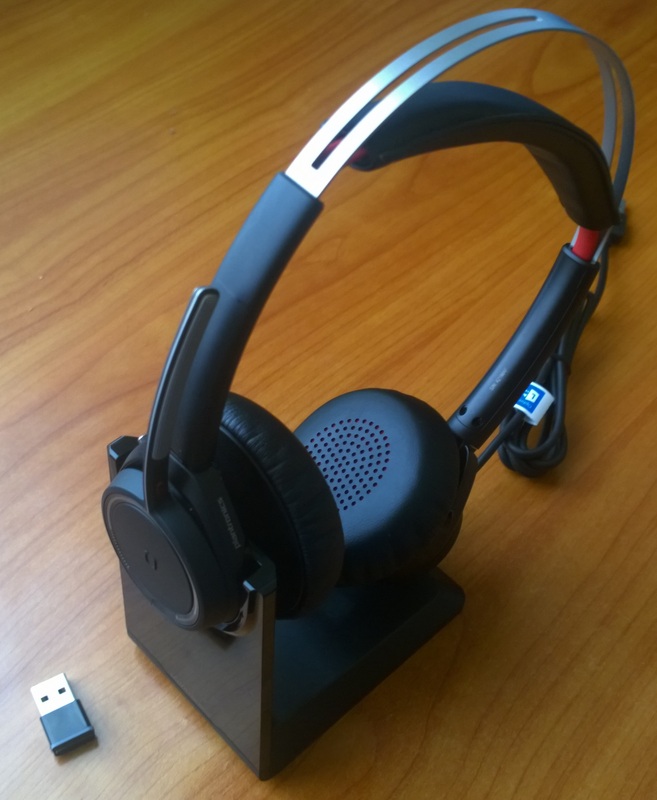 Last week Plantronics handed me their newest headset, the awkwardly named Plantronics Voyager Focus UC. Why the "Voyager" is stuck in there is beyond me. Brevity is clearly not part of Plantronics marketing angle. Upon first use my thoughts were "Amazing" and after about 1 week of heavy use I have no reason to change my opinion. In as normal a voice as possible, I have to say "This is the best headset I've ever used". The headset is fantastic but I have some issues with the rest of the kit – the dongle and the charging base, specifically. But I'll get to those later. This is a Bluetooth v4.1 headset. If you want to know what's so fancy with Bluetooth 4.1, read this summary. I can confirm that Bluetooth works very well with this headset. I have used it with the supplied dongle, directly paired to a Surface Pro (version 1), a Nokia Lumia 1020 Windows Phone, and a LG GPad 8.3 running Android. In all cases it paired easily. And while I'm no Bluetooth wizard, I remember seeing specs on some headsets that they supported pairing up to 2 or 3 devices. Well, I have paired this to 4 different devices. Each device picks it up right away so there is no 2-device pairing limit here. This also has fantastic range. While it won't compete with a DECT headset, the claim is (150 feet)/(45 meters). In the office I was able to go much further away from my desk than with any other Bluetooth headset I've tried. It won't make it into the bathroom at work which may or may not be a good thing (depending on how well the mute function works). Talk time is up to 12 hours (10 with Active Noise Cancelling(ANC)) or up to 15 hours listening time (12 with ANC on). I have not tested the talk time limit. But for Listening the thing finally died after 2 days of heavy use. Was that nearing 12 to 15 hours? Not sure but regardless – I am pleased with the battery life. As alluded to above, this device has Active Noise Cancelling. I used the Focus UC on a flight from Seattle to Detroit last Friday. I fired up the ANC feature while watching some shows on the Android tablet. It made a clear difference in minimizing the jet white noise. There was still a rumble to be heard but what I cared about was that the audio of the show I was watching was drastically improved with ANC turned on. I haven't used one of those fancy Bose ANC headsets so I can't compare. I did have a pair of ANC headphones when they first came out about 15 years ago. They were cheap but unlike those old headphones, the Plantronics did not in any perceptible way distort the audio while ANC was turned on. As seen in the picture, the main control of the headset happens by pressing the outside of the speakers. On the base of the microphone is a little button you can push to mute/unmute. One neat trick is that if you are muted and start to speak, this will alert you that you are muted. At least that's what it's supposed to do. It never worked with or without the Plantronics Spokes software installed. The closest I got is that I would mute myself on a call and it would immediately unmute me even though I wasn't saying anything. Pushing in on the outside of the speaker attached to the microphone is the answer/hang-up button. On the top of this speaker is the power switch to turn the headset on/off. Pushing this button past "on" sets it to Bluetooth pairing mode which I found a very easy way to enable pairing on the headset. Pairing with all the devices I tested worked well. There are also some lights on here which occasionally light up and mean absolutely nothing to me. The manual says they are "Headset LEDs for pairing, battery status, online indicator". Whatever. When charging, blue lights crawl from 1 to 5. The opposite speaker let's you control the music. On the outer rim is a dial you can move clockwise or counter-clockwise to increase or decrease the volume. Pressing the middle pauses the music. Pressing the outer edge will skip forward or back a track depending on which edge you hit. The ANC button is at the bottom of the speaker. You can see the little shiny metal in the picture above. When listening to music, the bass is well separated from the mids and high end. I won't pretend that I am an audiophile that can break all of this stuff down. The sound isn't quite on par with a pair of good on-the-ear Sony headphones I own but it's not so far off either. And as memory serves, they don't sound quite as good as the Jabra Evolve 80. But unlike the Evolve 80, these are very comfortable to wear. They are lighter in weight and don't cause a headache-inducing squeeze on my giant head. While I won't say the headset is anywhere near feather light, at (5.4 ounces)/(155 grams) it sits comfortably on my head. Perhaps the only downside is that my ears started sweating after extended listening. As for the microphone, it's small and seems to work OK. One neat trick on this headset is that it will automatically flip the Left and Right channel depending on where you prefer to have the microphone. Want to hear how the microphone sounds? I used the Skype for Business "Check Call Quality" feature.and then recorded the microphone. So this is what the computer hears. I am not recording what comes back via the speakers of the headphones. This is solely a test of the microphone and nothing else. The phrase I say is the nonsensical "I would like to eat pears for supper"
Like many of the new Plantronics headsets, you can answer a call just by picking up the headset and plopping it on your ears. Taking the headset off during a call is supposed to automatically mute the call, though I haven't tested this feature. I can verify that taking the headset off pauses the music. When you put the headset back on, about .25 seconds later the music kicks in again. This is a neat trick and I imagine it also helps with extending the battery life. So this headset is really great. It has a pile of features and – perhaps most importantly to me – music sounds great. So what's wrong with the Voyager Focus UC (beyond the long name)? Let's start with the manual, or the complete lack of one in the box. Instead, there is a piece of cardboard that says you should go to here to get the manual: http://www.plantronics.com/setup/voyager-focus-uc This isn't too big of a problem if you are using a PC for initial setup. I wasn't. I was using my Surface in tablet mode. Which means I had to type that long-assed URL in via the onscreen keyboard. Which sucked. Plantronics: Please provide a shortened URL or – better yet – a QR code I can scan with my phone (or even the Surface). Typing URL's is so 2012. But that's a minor complaint.Here's a bigger one. The dongle won't shut the hell up. Someone decided that the dongle should glow a nice blue. And sometimes for no apparent reason it should flash too. Now imagine you plug the dongle into a Surface and go to watch some Netflix before going to bed. The room is dark, you're watching your show but out of the corner of your eye, this damn dongle is lit up like Times Square on New Years Eve. It's distracting. So distracting that I threw the dongle aside and paired the headset directly with the Surface. This blue light isn't an issue as I am typing this as I have it plugged into a USB hub on the back of my monitor (I'm using a full PC here, not the Surface). I don't see the thing at all. But what I'd really like is to not see the thing…at all. Turn your light off, stupid dongle. I tried disabling it via the Plantronics Spokes software. But, as usual, that software proved generally worthless. There was no option to turn the light off. And boy, does that thing like to give pointless light shows. Every one of those is useless and distracting. But the biggest crime is the headset stand. Yes, the headset stand is nice and it's easy to dock the headset for charging. But the stand doesn't do anything else. It just charges the headset. Now imagine you are using a Surface with 1 USB port. You're hosed. You either use the stand, or you use the dongle. You can't use both. But why not use a USB hub, especially on a laptop or a full PC? Sure, that's fine, but how many more ports do I now have to use? A port for a keyboard and a mouse dongle and a webcam and a speakerphone and a Zune dock and a port for my phone. Now I have to waste 2 ports for 1 headset? It blows my mind that the fine engineers at Plantronics completely missed the concept of plugging the dongle directly into the base and then using the cable out of the dock into a single USB port. The USB cable to the stand is only being used for power to charge the headset. Why can't you pass the signal from the dongle down the same cable? I know I'm not the only person to provide this feedback within 24 hours of trying this thing out. 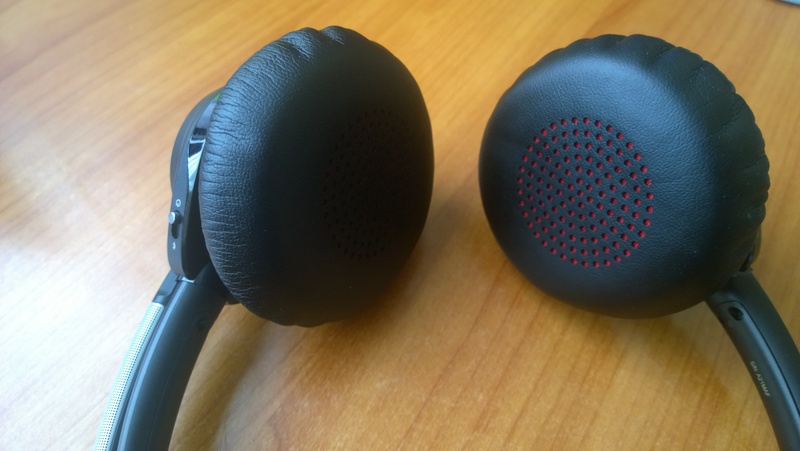 If it's so obvious to 2 end users in under 24 hours of use, how could Plantronics have slept on this? It's so obvious! Note that the headset does have a micro-USB port on it so you can charge it with the same cable you use to charge your phone (unless you use an iPhone at which point…yeah…good luck with that. Use the USB cable that comes in the box). I'm indifferent as to my opinion of the voice that talks to you while using the Focus UC. When you turn it on it says "Power On". Thanks Mr. Wizard. It also says "PC connected" or "Phone connected" as necessary. That's OK. The worst is when turning the volume up it says "Volume maximized". I'd much prefer a beep. "Volume Maximized" is too long a phrase, is hard to hear when listening to music, and when on a call I don't need the headset talking over the conversation. When turning it off…yeah, it says "Power off". Thanks. You're a real life saver. There is an "OpenMic" setting which open the microphone so you can hear your surroundings. This is a cool idea. The problem with headsets like this and the Evolve 80 is that I can't hear people calling my name at work. Turning on the microphone would let me hear that. Except when I turn on the microphone, it drastically decreases the volume of the music. I guess this feature is only useful if you are using the headphones with ANC enabled to cut out white noise and *not* listening to music. This is a potentially cool feature messed up by poor implementation logic – at least in my heavy-music-listening work day. The other downside on this headset is the price. $299USD. That's a stiff price. Amazon has it for $228.54USD right now. But if you compare it to the $329USD on Amazon for the Jabra Evolve 80, then this is a downright steal. In summary, this is the best headset I've ever used and it is absolutely my go-to headset now. Too bad Plantronics didn't take the same care for everything else beyond the headset. That prevents me from saying this whole package is perfect. But if you can work around the dongle and base issues, then buying this thing is absolutely recommended. I'm using one of my million spare usb wall chargers to power the stand. Crisis averted. I think the dongle light thing depends on use case. Some (and I admit, maybe only some) of those indicators are useful in an office environment – specifically the “On a Call” and “Mute Active” ones. I would prefer a light on the mike itself to indicate mute, but I guess a small boom like this one would probably not be visible, so an indication on the dongle is useful. Great review!! Thanks. It helped me make a decision and just bought a pair for myself. this includes the Bluetooth USB adapter. This is true. I have 4 devices paired, but only two can connect simultaneously. If you already have two phones connected, the PC dongle won’t connect. Then if you turn bluetooth on one of the phones, or else go to bluetooth settings and disconnect manually from “PLT_Focus”, a few seconds later the headphones will find the dongle and connect to the PC. It works the same way on the Plantronics Voyager Legend UC which I’ve had for almost a year now. Agree, I hate the flashing LED, I hate that it does not work in a hub. How do you get to hear yourself when you speak, as far as I can see there is no such function? quick question…I just put in a bid on ebay for one of these…The 825-M version…..But realized this is certified for Lync…..
Do you know if this version will work on a soft phone programme at all if you dont have lync? Hi, the headset should work with any softphone. It will appear as an audio and recording device in Windows that any program should be able to use. My BT600 dongle just failed. I really don’t want to shell out $60 for a new PT dongle. Will cheaper BT’s work ok with this? Yes, cheaper dongles will work. That’s the whole point of Bluetooth certification. However, keep in mind that the Bluetooth dongle that ships with your headset is optimized for that headset. So while using a cheaper dongle will pass voice and audio, you may lose out on enhanced range, increased audio distortion, etc. Thank you for taking the time to review this product. Does anyone know if you can use the product WHILE charging? There are those situations where you forgot to charge it and all of a sudden you need to make a skype call. If you plug it in with a dead battery will it start working right away or will you need to charge it for at least 5min or so? And will it work while charging? The charge stand can be used to update the product as well. I just learned that and I can now have more control over settings on the headset through the Plantronics Hub, the software you can use to tweak the headset. For example before the update, I had not noticed the ability for me to listen to music on my cell phone, I was only able to take calls. Now I listen to music on my phone too. Yes, it does a really good job of removing background noise. I’m struggling to have the headset work with Skype for Business on my surface pro without the dongle. I can get it to play back audio from the surface on videos etc. but it won’t work with Skype. ‘d prefer not to have to use the dongle as it uses my one and only USB port but I can’t find any setting to do this. Yes you shouldn’t have to use the dongle. The dongle does have advantages such as better sound quality and extended range. It hasn’t been an issue with me when mobile on the Surface Pro as I have a Bluetooth mouse which doesn’t need the USB port. I also travel with a small Amazon USB hub which gives me extra ports when I really need them. Thanks for the reply. I will continue to mess about to see why the headphones work on everything other than Skype without the dongle. Thanks for the review also. I have previously owned Jabra Evolve 65’s and I think I prefer them over the Plantronics with the exception of build quality. The Jabra’s are woeful and the sliding arms for adjustment broke on 3 pairs (now out of warranty) despite me treating them as very delicate things). I’m hoping the Plantronics get better as I learn how to use them more. I actually like the indicators. not only does it help others see if I’m busy but I can also use it as a way to checking notifications from the distance. and beyond all that it’s optional. most devices already have Bluetooth. the only time I suspect it’s really necessary is if you are having severe interference issues. it works fine without the dongle at all and more seamlessly. if you hate the lights so much just use a bit of electric tape.